“It has that ability to transform lives, to free people from Darkness.” – Br. Daniel Maria Klimek, T.O.R. 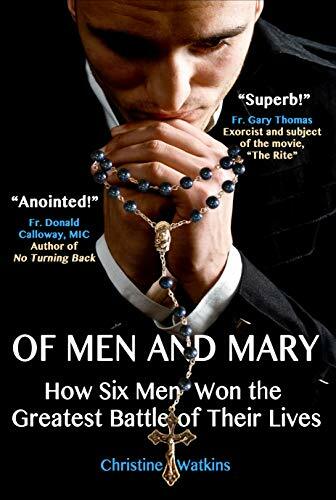 Turn the pages of Of Men and Mary, and you will find yourself surprisingly inspired by a murderer locked up in prison, a drug-using football player who dreamed of the pros, and a selfish, womanizing dare-devil who died and met God. You will root for a husband and father whose marriage was a battleground, a homosexual man searching desperately to belong, and an innocent lamb who lost, in a single moment, everyone he cared about most. And you will rejoice that their sins and their pasts were no obstacle for heaven. All of these men became living beacons of hope, walking proof of the triumph of the human spirit over darkness. In the heat of the fiercest of spiritual battles, when all seemed lost and these men were left with nothing to stand on but stormy seas, they were given a lifeboat, a new path in life—one that they never dreamed of, not for an instant. They were pulled in a different direction that, at first, they didn’t want, and then at last, they loved. In the boat of safety, they sailed with sure victory into breathtaking, unknown vistas. Some became priests—one, a deacon, and two have since reached their eternal shore. This book exposes the inner lives of six remarkable men: their private guilt, masked pain, secret hopes and loves—things they normally do not share, but perhaps with one human being. Yet, by the prompting of the Holy Spirit, they have openly revealed to us what most men never do, their souls. We have the privilege of experiencing the exciting, exotic, and even intoxicating strength and vulnerability that exist within their hearts. While this book may be about six males, it is for everyone, because it is also a book about a woman. That woman is the Blessed Virgin Mary. She is the boat of safety for all of us, the surest and safest passage to the heart of her Son. She is our victory and sweet reassurance that God’s plan is infinitely better than our own; and she is our challenge to follow her Son, no matter the cost, no matter how fierce the battle. Read the stories of these brave men, and you will inevitably come away with a desire to climb in the boat with them and sail safely home.